A few months ago my husband and I bought a fifth wheel. As a relatively young couple it would have made sense if we purchased ourselves a glitzy little toy hauler to pull our goodies in, but no. Instead we bought a fifth wheel from my grandparents and aged ourselves a good twenty years. I love the thing, though and there’s no denying that hauling your home away from home is the coolest thing since cold beer. I’ve towed plenty of things in my day: ball mount trailers, other vehicles…But never a fifth wheel. And never did I think that it would cause me to have a minor panic attack. I don’t know if it has to do with the fact that while hooked up to the fifth wheel you can’t see behind you, or you feel like the thing is about to run over you, but it made me a tad nervous and jerky when we first hauled it home. Transmission Learning Modes: Our tow vehicle is a 2005 GMC Sierra Duramax diesel. The Allison transmission that comes with our truck is equipped with a “learning mode” that allows the truck to adjust its shift point based on the load that you’re towing. During that time, you will feel as though you’re about to use up your first Good Sam tow before hitting the freeway. Don’t freak out. A large diameter diesel exhaust routed straight back is cool for daily driving. 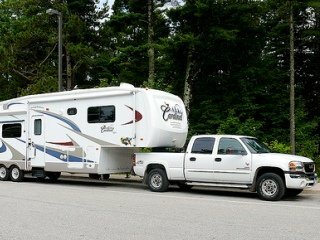 It becomes a thunderous, annoying vibration while towing a fifth wheel. Tailpipes should exit the side of the vehicle before somebody goes deaf. After the truck settled into ‘er groove, and we opened up the throttle to a smokin’ 55 miles per hour, I realized we couldn’t see anything past the first 8 feet of the trailer. Lesson #3: Always use tow mirrors. Big, adjustable tow mirrors. I don’t care if my truck looks like it’s about to take off in flight. I’d like to not have to rely on prayer and luck each time that a lane change is required. Admittedly, most of our glitches reared their ugly heads within the first 5 minutes. After that it was smooth sailing until we arrived home two hours and 100 miles later, where we needed to back the fifth wheel into its new parking pad. Lesson #4: Husbands and wives should develop a very firm system for back-up signals prior to attempting to maneuver any large object. My husband’s no idiot…He’s a skilled driver. And I’m not exactly a hand signal novice, but you would have thought Larry and Moe were running the show that afternoon. He couldn’t hear me over the exhaust, couldn’t see me in the mirrors and apparently had no trust in my depth perception. However, after 10 minutes and 3 tries, the house wasn’t hit and neither was I. Less patient couples, however, could easily find grounds for a divorce in the process required to back up a trailer. After setting down the jacks, chalking the wheels and releasing the hitch, we headed inside to up our insurance limits, extend our Good Sam membership and scour E-bay for mirrors. Next week we’re taking the ol’ hog on her first inaugural camping excursion. I’m praying for large parking spaces at the camp sites.